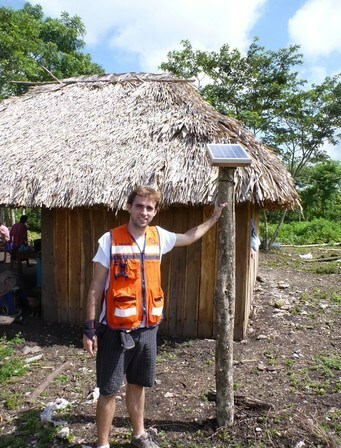 Manuel Wiechers Banuet is a 24-year-old Mexican entrepreneur, who has co-founded Ilumexico, a non-profit organization providing electricity in rural communities through solar energy and efficient LED lighting. Manuel believes that his project is original in two ways. Firstly, it developed a “solar controller that optimizes the use of the system for conditions in Mexico and also allows different functions for lighting that makes it last longer… (It) also makes the system very cheap and of good quality… (My) plan has three different lighting settings that permit different activities depending on the needs. We have also incorporated light and presence sensors to optimize the systems that can be used in less impoverished areas.” Secondly, the technological part is combined with rural development programs. The young Mexican’s company has already installed over 1,000 solar panels and intends to reach 4,000 in 2013 with public and private funding. The scheme is also accompanied by rural development projects, in which local community members are deeply involved, in order to demonstrate that “their efforts are rewarded with benefits for them and their surroundings,” and to motivate them to bring change for their community, by coming up with new ideas. At the same time, Ilumexico is striving to involve university students to become volunteers and help those who have not benefited from the same opportunities as them and to inspire them to become social entrepreneurs. Ilumexico currently has 50 approved university student volunteers. Ilumexico has also installed solar powered lighting and computers system in 11 schools, while hoping to scale the model for 30 schools each year by 2015 and 50 by 2017. In some of the schools, Ilumexico also ensured Internet-access or other educational resources, such as programs for environmental awareness, health, nutrition and social/gender equity. The programs range from giving schools access to clean water and adequate bathroom facilities, to reforestation programs, health and nutrition workshops, gender-equity activities and sports workshops. This combined method ensures that students receive a quality education and are able to learn and adopt practices they can apply at their homes. The decision to create Illumexico came about after the young entrepreneur attended the Energy Summit in Calgary, Canada. He took part in a conference on renewable energies for developing countries, where the expert explained how to use renewable energies and diverse sustainability projects in rural communities. Upon returning to Mexico, he contacted several classmates working on lighting systems and discussed with them the possibility of using solar energy. After they accepted to join the cause, they worked on the prototype and social scheme. In terms of obstacles faced, Manuel reveals that it can be difficult to convince rural inhabitants to adopt solar energy systems, given the role that customs play in their lives. In order to address this issues and to ensure that the project is not a technological imposition, but a program that people believe in, Ilumexico has created manuals and strategies. The young entrepreneur’s organization has won the Santander Prize for Business Innovation as well as the Rompe Prize for Climate Change and occupied fourth place in the Iniciativa Mexico contest. Manuel has received numerous awards as well. He has been selected by Forbes as one of the “30 under 30 Latinos” and has been awarded a scholarship from the Dutch government to attend the COP 15 of the United Nations Framework Convention on Climate Change in Copenhagen. In terms of upcoming plans, the company is focusing on developing new products for both rural and urban impoverished areas, such as hydroponic modules for people to produce their own fruits and vegetables at a very low cost. Manuel reveals additional plans: “Through our student volunteer teams, we wish to create new projects based on community needs and give the economic resources for these projects through a community revolving fund: this fund works because once we purchase the lanterns that we manufacture with donations, the credits that people are paying go into these funds and students with community members can propose their project and have access to the funds to develop new projects.” Finally, Ilumexico wants to fully integrate with the Mexican government’s initiatives create alliances in Central America, to expand the client base and distribution network.